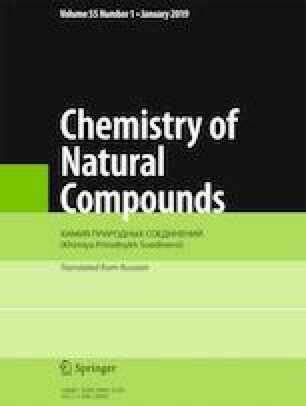 Fractionation of the BuOH-soluble fraction of the liquid fermentation of an endophytic fungus Ophiocordyceps sobolifer BCRC 38180 associated with the root of Taiwanese Ilex formosana (Aquifoliaceae) resulted in the isolation of one new diketopiperazine, soboliferamide (1), and one metabolite isolated for the first time from a natural source, cyclo-(Ile-Ser) (2), along with 18 previously identified compounds, 3–20. Their structures were elucidated by means of spectroscopic and mass-spectrometric analyses, especially 1D and 2D NMR spectroscopy, as well as HR-ESI-MS. Published in Khimiya Prirodnykh Soedinenii, No. 2, March–April, 2019, pp. 265–267.